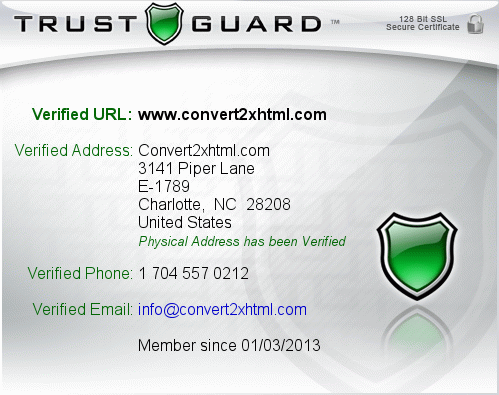 Security Verified : In order for www.convert2xhtml.com to qualify for the Trust Guard Security Verified Seal, we verify that their website is using at least 128-Bit SSL Encryption on pages where private information can be entered, such as credit cards, Social Security numbers, loan information, etc. and we monitor the SSL certificates expiration. Email Verification - An email is sent and received to www.convert2xhtml.com in order to confirm their support email address.